Springtime in the mountains means unpredictable weather. One day it may snow, the next day it can be 60 degrees and sunny. I don’t believe in weather ruining your outdoor fun. As long as I have a dry warm place to return to, I go outside no matter the weather. 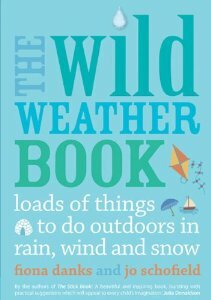 The Wild Weather Book: Loads of things to do outdoors in rain, wind and snow by Fiona Danks and Jo Schofield (the same authors of The Stick Book), is full of wonderful photographs and ideas to inspire your children play outside no matter the weather. Curl one end of a length of fine wire into a small spiral and then feed the spiral end inside and uninflated balloon. The other end of the wire should be sticking out of the neck of the balloon. Place the balloon over the spout of a tap and fill with water. For coloured baubles, add a couple of drops of food colouring to the water. Remove the balloon from the tap, and either clip a peg over the open end of the balloon or tie the end with a thread. What I really like about this book, in addition to the activities, are the photographs. They really inspire, especially the mud pie!